So, new Australian Prime Minister Malcolm Turnbull wants to have a “conversation” with the Australian people and “explain” policies in a way that respects our intelligence. Excellent. He will be better at this than Abbott, and new Treasurer Scott Morrison will be better than Joe Hockey. Turnbull began the conversation on Sunday in announcing his new ministry. In this speech he used the term “prosperity” in one form or another (including “prosperous”) at least three times. This is interesting and welcome. We hear about “growth” and “productivity” but hardly anyone understands what they mean and why they are important. Prosperity is a term that captures those ideas in a way people can better understand. He didn’t define prosperity but let me suggest he is talking about living standards. The best indicator of living standards is national income per person which has grown at an average rate of 2.3% over the past 40 years, but has fallen sharply in recent years. In fact the growth rate has been negative in recent years meaning living standards have actually fallen. There are three principal drivers of living standards and they are all going in the wrong direction: labour productivity which has fallen from historic average of 2% growth to 1.4%, the terms of trade which is essentially prices the rest of the world are willing to pay for our exports and have fallen by 30% from their peak in 2007, and the share of the population in jobs which has fallen about 2% since 2005 and is set to fall by another 3% over the next few decades. The driver we can do most about on a sustained basis is labour productivity. The employed share of the population is important too but it can’t be increased forever. In improving living standards, the new team of Turnbull and Morrison face huge challenges and unfinished business. One challenge, surprisingly and unfortunately, comes from their own principal advisers in Treasury who have completely lost the plot when it comes to thinking about how to raise living standards. Treasury sees its mission as improving the “wellbeing” of the Australian people by which it means improving “a person’s substantive freedom to lead a life they have reason to value”. Well, that’s nice but it’s more like the advice a parent gives their child rather than the basis for measurable and achievable goals of economic policy. It leads to a vague un-prioritised and unmeasurable list of indicators including the “risks” people face in life, “complexity” of choices they face, and “sustainability” of their opportunities over time. Remember, this is the framework of the “institution with the chief responsibility for providing economic advice to government”. So clearly Turnbull and Morrison will need to do their own thinking on how to raise living standards. They should return to the big themes that Joe Hockey tried unsuccessfully to articulate two years ago: the culture of entitlement to taxpayer handouts and the huge growth in government spending. And they need to somehow find a way of putting serious tax reform back on the agenda and also tackle industrial relations reform in the wake of the alarming revelations of the trade union Royal Commission. The public discourse on tax reform is beginning to run off the rails. 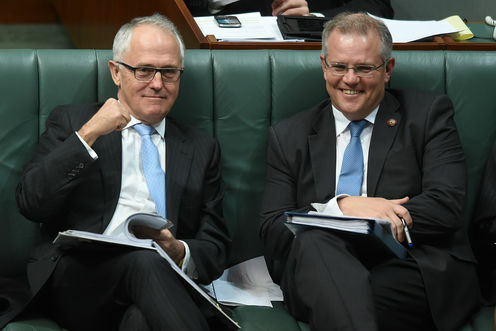 It has become about how to raise more revenue to fund rising government spending on health, aged care, disability insurance, child care and a raft of other welfare measures. Morrison needs to turn this debate around. Higher taxes to fund more welfare is not the way to raise living standards. Consider these observations. The Australian budget deficit has fallen as a percent of GDP from its highest level since 1970 of 4.2% in 2009-10 to 2.6% in 2014-15. But this has been due entirely to rising tax revenue rather than cuts in spending which has stayed the same as a share of GDP. Over the same period government spending in the US, U.K. and New Zealand decreased as a share of GDP. Yet GDP is growing at least as fast in these countries and their unemployment rates are lower than in Australia. Morrison must explain that taxes have costs to living standards. A standard estimate is that for the average dollar of tax that is raised, about 20 cents is lost down the metaphorical toilet – a “deadweight loss” is the polite term. It refers to the costs in output caused by the disincentive to employ labour and capital. So an extra dollar of spending that must be financed by taxation needs to earn a 20 per cent rate of “return”, which is a high bar. Hence the challenge for Morrison is to explain that we can’t just spend and tax our way to higher living standards. On tax reform, Morrison also needs to address head-on the myths in the public debate. The worst is the simplistic criticism that a higher GST would be inherently unfair because a given amount of GST is a higher share of a low income than of a high income. First it ignores life cycle effects – young low income people are often high income people in the future. Second it ignores the ability to compensate welfare recipients and the working poor while still leaving plenty of revenue to reduce other harmful taxes – a package that would add about 2% to living standards. This leads to another myth – that company tax cuts are just welfare for the big end of town. Quite the opposite – the biggest winners from company tax cuts would be ordinary workers. This might be counter-intuitive but it is very widely accepted among tax experts and has a strong theoretical and empirical basis. The reason is that company tax cuts would encourage capital to move to real businesses that employ workers, which would increase employment and wages. The next huge field of opportunity is industrial relations reform. Here Morrison will need Turnbull the lawyer and smooth talker. Based on the Royal Commission evidence, trade unions and business (both are to blame) have had their snouts in the trough at the expense of workers and taxpayers. And they will need to show, without mentioning the words “work” and “choices” in the same sentence, that in fact giving individual workers and employers the right to negotiate their own terms unfettered can drive employment and prosperity.